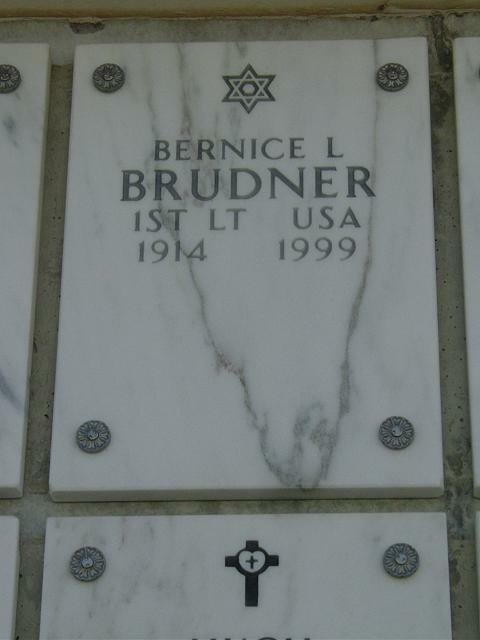 Bernice L. Brudner, 85, a longtime Rockville resident who came to the Washington area soon after serving as an Army nurse during World War II, died of liver disease December 15, 1999 at Montgomery General Hospital. Mrs. Brudner, a native of Syracuse, New YYork, was detailed to a hospital on the Hawaiian Islands during the war. She moved to Washington a year after her discharge in 1946 and devoted her time to raising a family. She was a member of the Women's War Memorial Association. Survivors include her husband of 53 years, Benjamin Brudner of Rockville; two children, Philip Brudner of New Market, Md., and Mibs Brudner Parker of Oakton; a grandson; and two granddaughters. On December 15, 1999 at Montgomery General Hospital. Beloved wife of Benjamin B. Brudner; devoted mother of Phil Brudner and Mibs Parker; loving grandmother of Derek Parker, Nicole Brudner and Tammi Brudner. Services will be held at Arlington National Cemetery on Tuesday, December 28 at 3 p.m.